Well hello there, first-Thursday-in-August, you sprung up entirely out of nowhere didn’t you? I saw Paula and Steph posting this morning and genuinely thought they’d got the date wrong, until I actually looked at a calendar. ANYWAY, here I am too! Remember last month when I didn’t have any new socks on the needles? 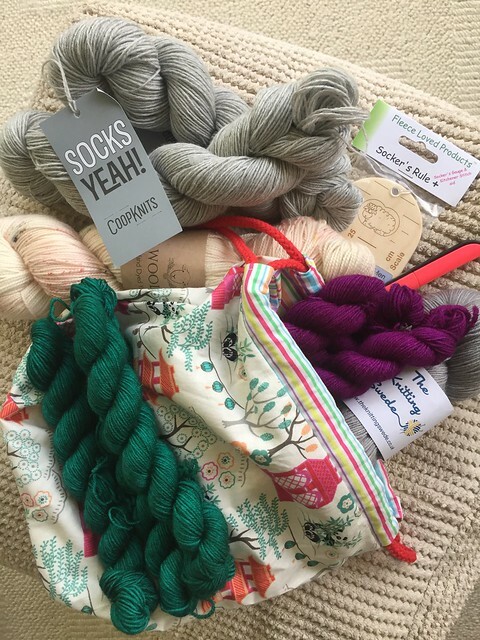 You won’t be surprised to hear that that didn’t last long – I have MUCH sock-related goodness to tell you about this month. Firstly (and sorry to keep banging on about it but I am SO EXCITED), my Retro Dream socks pattern launched on Saturday, hooray! You still have a few days to get a 20% launch discount on the pattern cost, if you buy it before the end of Sunday (UK time). Secondly, my Swirls and Stripes socks are freshly out of testing and I’m making the final tweaks to that pattern now – expecting it to be live by the end of the month so watch this space. Thirdly, I went to Fibre East on Sunday and bought ALL THE SOCKY GOODNESS. Such a lovely festival, made all the nicer by being with ace friends, and having the opportunity to splurge a bit on a few excellent sock items (I’d planned not to buy much at all but, y’know, stuff happened). Starting at the top and working clockwise, we have: two skeins of Socks Yeah! in Danburite (deliberately a light grey to work as a contrast colour for some future colourwork socks); a ‘Socker’s Rule‘ from Fleece Loved Products (all of my friends went for one of these – can’t resist a gadget! ); some dinky fold-in scissors (the thing which looks like a pen! ); purple and jade BFL 4-ply mini-skeins from Riverknits; a skein of Spartan sock yarn by The Knitting Swede in ‘London Fog’ (to act as the contrast to the Riverknits purple and jade); a project bag from JibbyrooSews (extremely reasonable prices on these, highly recommend); and finally the most heavenly speckled skein of Twist Sock in ‘Blush’ by The Wool Barn (that subtle warm speckle sang to me all day at the festival and I had to go back and buy it before I left – sooo pretty!). Oh and lastly – you want actual socks? OK then. I keep seeing friends making cute little ankle socks with rolled tops this summer and couldn’t ignore the little voice at the back of my head saying ‘hey, they’re adorable, I want some of those’. So I looked at my stash, opened a brand new page in my knit-design notebook, and ended up with these. I think they’re ridiculous but also really sweet! I’m using the Sundara Yarn which Katherine gifted to me in the stash swap a couple of months ago, paired with the very end remnants of some old Regia sock yarn (I ended up with barely 1g left of that – was a little nervy, but very satisfying to use up some sock yarn almost exactly!). I think the pattern for these socks (like a few others) is going to have the option for a short-row toe or a decrease toe. 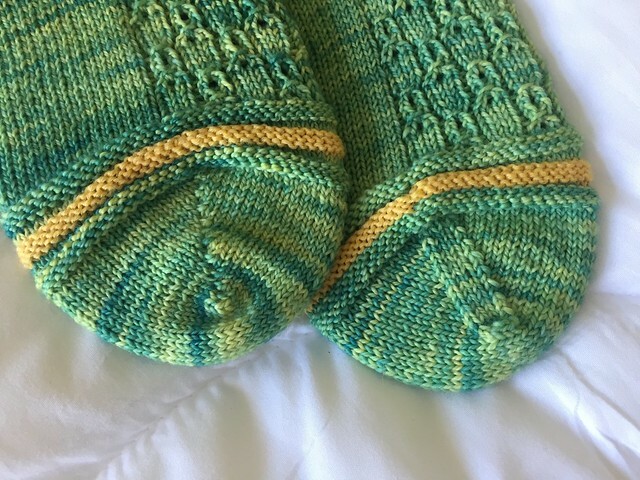 As it happens, I currently have both on show so you get to see something in all of these pictures that won’t appear on the pattern – both toes on one pair. I’m going to reknit the decrease toe because I spotted a mistake (missed out a row on the reverse stockinette section, whoops) and it’ll to turn into a short-row toe because I really do think they look more knitterly and lovely. If you buy the pattern you’ll get the option for either, though. Probably worth saying that I didn’t start off with quite how the end result looks – as ever there was some knitting and reknitting to get it right. Here’s an early work-in-progress shot which is.. well, kinda fugly, no? I loved the rolled hem, and I wanted the reverse stocking stitch ‘bubble’ rounds around the ankle, but I wasn’t sure what else to do. Turns out, for actual ankle socks, you don’t need anything there at all! I also spent aaaages trying to make a honeycomb stitch pattern work on the foot. This bit isn’t fugly (though you can’t see it on the photo very well), it is beautiful. What it isn’t, though, is at all stretchy. I KNEW this. I KNEW that heavily cabled stitch patterns are a bad idea for socks. And yet it took me several goes at knitting the gusset, reducing that section and adding more ribbing either side each time (and barely getting it onto my foot no matter what I did) for me to accept that it’s a terrible stitch pattern for the foot of a sock. Sigh. So, anyway, I ditched that altogether and went with a nice stretchy twist on k3, p1 rib instead. I love the way this makes little bubbles fizzing up the foot. All in all this pattern has basically named itself – can you guess? And I think that is enough for now – this post is becoming a monster! Are you doing any sock knitting at the moment? Want to join in with a group of us doing monthly sock posts? Check out Paula’s post for more information, and you can see who else is diving in this month right here. 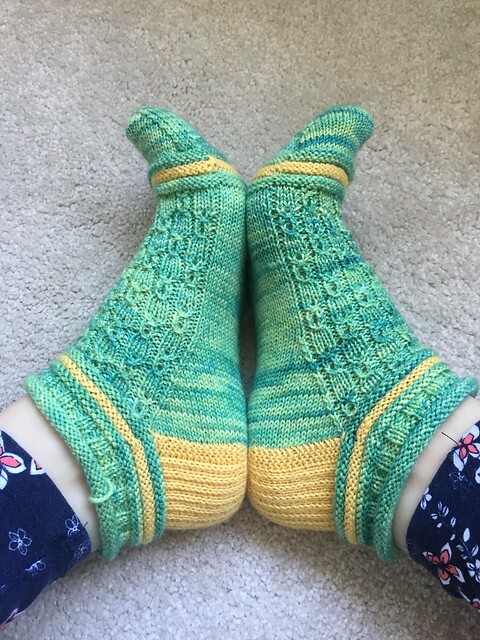 Previous Post Retro Dream socks – pattern launch! Oooh, you are a sock designing machine, right now, Kat! Well done! I have…apparently deleted the pictures of my sock in progress, so that’ll have to be recreated when I get back home to them tonight! Haha, thank you – something creative has def been unlocked since going self-employed! That’s a great haul. I’m impressed by your levels of restraint! I’ve been thinking about ankle socks for ages! With my still puffy ankle, I’ve been stealing sport ankle socks from Himself. Of course by the time I finish my current socks it’ll be Autumn and I wont need them. but the idea is there. Well and truly parked for next Spring. If I do forget, please remind me. And of course yours are stunning as usual. Ankle socks are ace! So quick and satisfying. Kat…you little minx! I wasn’t going to buy the Retro Dreams socks because I thought it would be above my head; however I can’t resist a sale and I will get there one day, right? And on top, you’ve designed more socks? To quote Meg, you are definitely a sock designing machine! The new pattern is fab too…I love them! I think that I would just start with the roll though and not put in the bit above the roll. Otherwise, I love everything else about them…including the colors. You go girl! Hahaha! I should perhaps warn you now that I think most future patterns will have a launch discount, too 😀 But also you are SO lovely for buying another of my patterns – thank you! 😘 You know where I am for free pattern support if/when you ever need it! I love the cuff on those bubble socks! 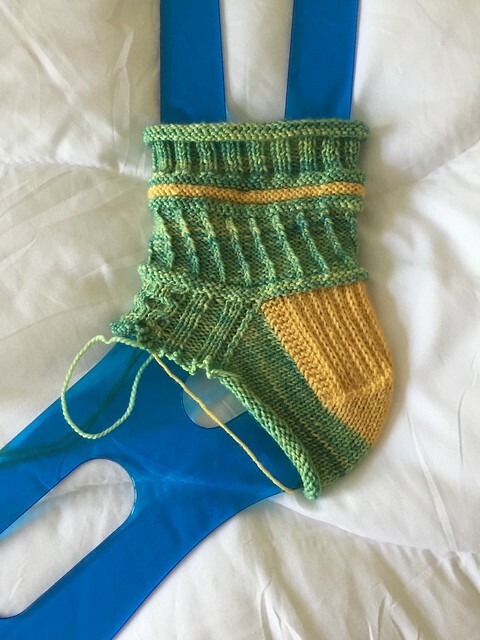 I couldn’t have the bubble in that placement on the foot, as I have bunions and that would be uncomfortable…..but the rest of the sock is beautiful……and stash enhancement is always lovely to see…. Ahh, thank you 🙂 the bubble on the toe is surprisingly un-noticeable when you wear it, but it could always be knit flat on the foot part for people with sensitive feet, hmm, that’s a good suggestion actually… thank you! I am in awe of the amount of socks you’ve designed this year. 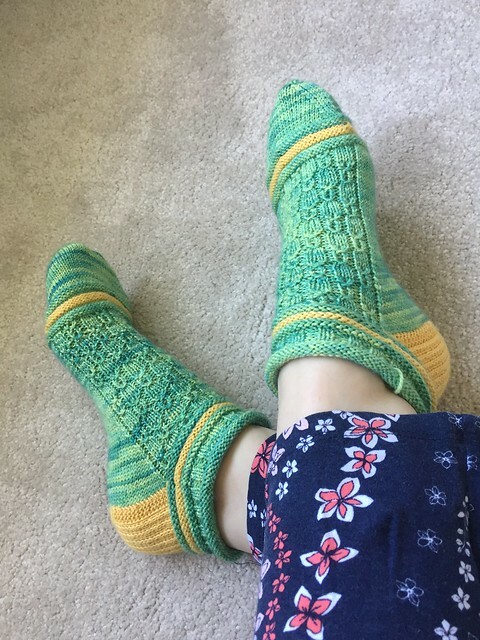 These citrus bubbly socks are amazing! I look forward to seeing what next month brings! I like that awesome green you picked up and that vibrant, moody purple yarn.